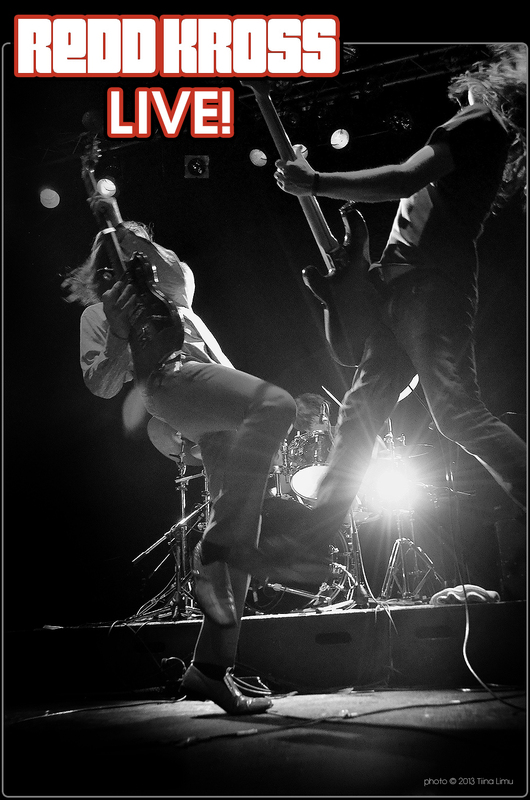 REDD KROSS ANNOUNCE NORTHERN AMERICA TOUR DATES FOR MARCH/APRIL 2013! Photo by tiinaliimu.com/musicphotography. Used with permission. For the first time since 1997, Redd Kross will embark on its first full-blast run of shows along the east coast and in the Great Lakes area. The same is true for San Diego and the Mojave Desert! The band will also join Dinosaur Jr. on several dates in Australia. For these upcoming dates, Redd Kross will work with Burger Records (the label that put out Researching the Blues on limited-edition cassette) to find “Burger-approved” local support in each town. Steve tells us that Lee from Burger will also be driving the guys around in the Burger Van, selling merch and maybe even guest DJing on special nights. Also, longtime Redd Kross fans will be excited to know that the band plans to dig deep into its 30-plus-year career-spanning catalog, playing such underground rock classics as “Annie’s Gone,” “Linda Blair,” and “Annette’s Got the Hits” in addition to songs from the recent album. Researching the Blues features 10 new songs clocking in at just under 32 minutes. With songs written by co-founder Jeff McDonald and produced and mixed by Steve, the album is by far the band’s favorite record. LIVE PERFORMANCE & INTERVIEW On The“Doom, Gloom, & Happier Things” Show starts at 5:15pm this Friday. 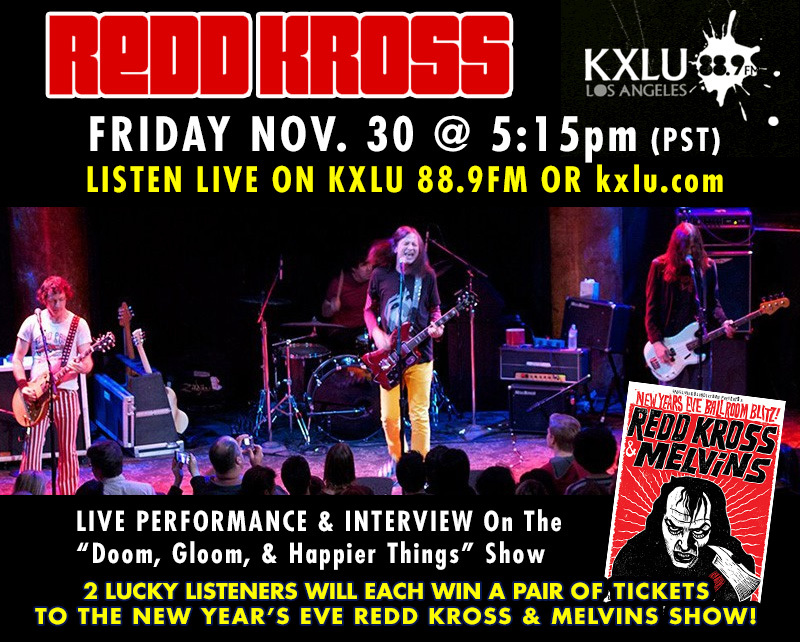 2 LUCKY LISTENERS WILL EACH WIN A PAIR OF TICKETS TO THE NEW YEAR’S EVE REDD KROSS & MELVINS SHOW! A Very Special New Years Eve with Redd Kross & The Melvins! Tickets are on sale now! Don’t delay! 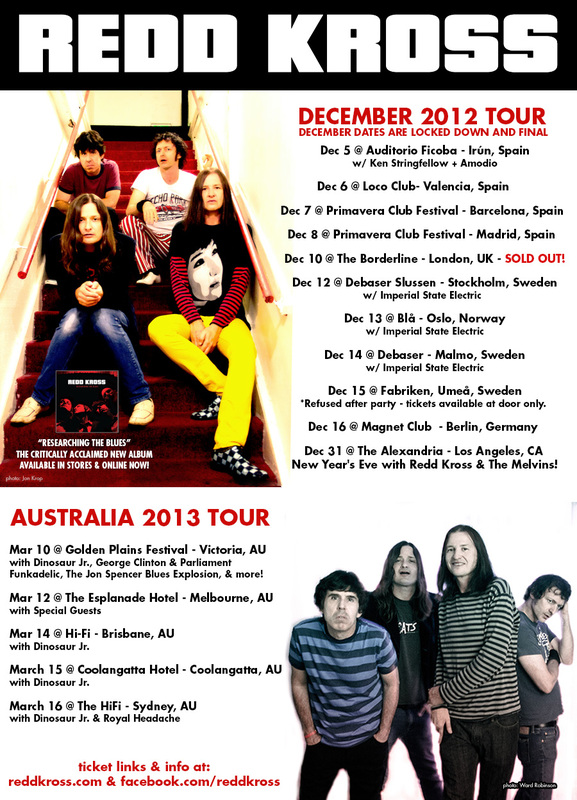 REDD KROSS : DECEMBER “TASTE OF EUROPE”, NYE w/ THE MELVINS, & MARCH AUSTRALIAN TOUR DATES. December European tour dates for Redd Kross have now been locked down, no additional dates will be added this time out, so if you want to be sure to see the band live, please plan a trip to the closest show near you. London show has SOLD OUT … so don’t procrastinate! For those of you looking for a memorable New Year’s Eve, Redd Kross will perform with The Melvins (for the first time ever!) in Los Angeles. This will be a very special event, hosted by Rodney Bingenheimer & we’re planning some surprises. Redd Kross is also heading back down under in March for the Golden Plains Festival, some shows with Dinosaur Jr. and a side show in Melbourne. Dates and ticket links below, looking forward to seeing you in the front row! Dec 10 The Borderline London, UK SOLD OUT! 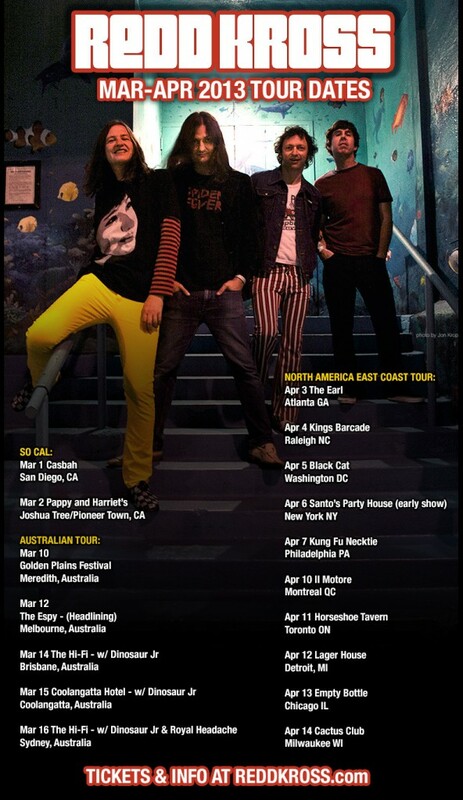 Redd Kross adds March dates in Australia with Dinosaur Jr.! Tickets $60.00 + bf Tickets on-sale from moshtix.com.au, feelpresents.oztix.com.au phone 1300 THE HIFI or in person at all Moshtix & Oztix outlets. Redd Kross Announce Tour of Europe for December 2012! Dec. 6 – Valencia Spain Just Added! 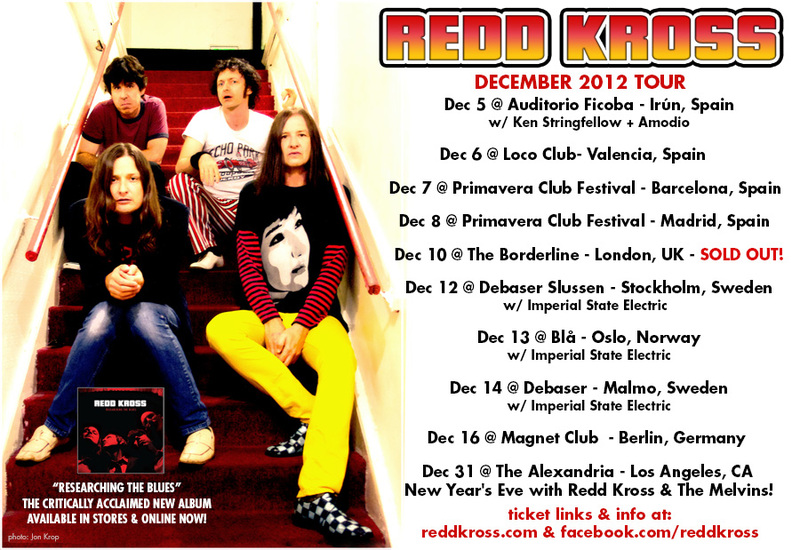 Redd Kross are thrilled to announce their Dec. 2012 Tour of Europe! The band will will be performing in Spain, Sweden, Norway, Germany, and the UK. The London show has already SOLD OUT! 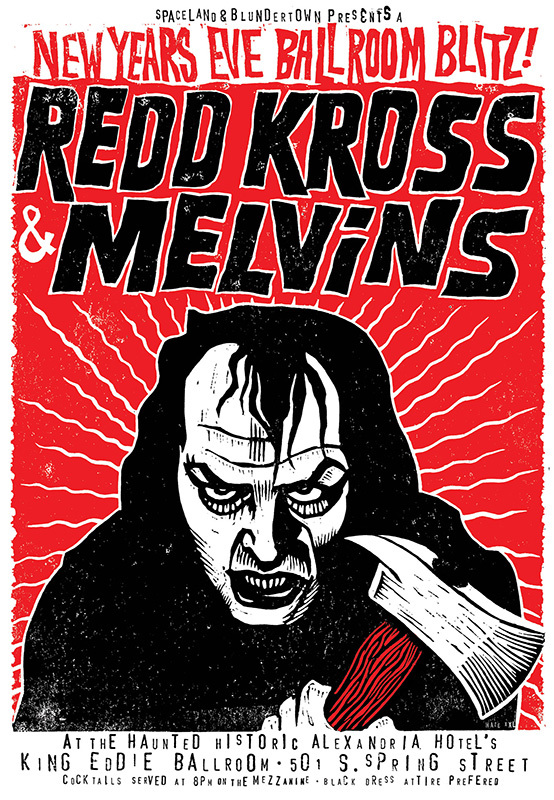 Redd Kross will also ring in the New Year with The Melvins in Los Angeles! Don’t miss out on these final shows for 2012! The Borderline – SOLD OUT!